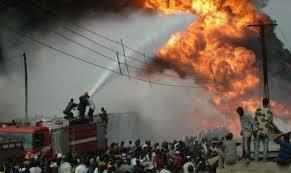 Some shops along Commercial Street in Bolgatanga, Upper East Region, were burnt to ashes following a gas explosion. The affected shops include that of the main vendor of the DAILY GUIDE newspaper. Eyewitnesses claimed that they heard a loud explosive sound behind the shops and later saw smoke and then fire from the roof of a canteen (Good Taste), which spread quickly to other adjoining shops. The dryness of the materials used for constructing the shops, the wind direction and the gas emitted from the exploded cylinders caused the fire to spread very fast. After personnel from the Ghana National Fire Service had come to put out the fire, nothing was left in any of the affected shops. As usual, eyewitnesses blamed the firefighters for responding late to calls; but a senior fire officer said that his outfit responded at the right time, but the destruction was due to the elements that combined to spread the fire. He indicated that the Service was yet to conclude investigation to establish which of the shops caused the fire outbreak. Shop owners said they had lost goods worth several thousands of Ghana cedis and would find it difficult to bounce back into business, if no help came in as soon as possible. The DAILY GUIDE vendor, Mrs. Manu lost all the newspapers received for February 23, as well as other newspapers and magazines.